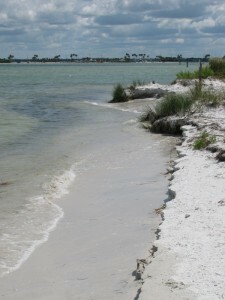 Caladesi Island is accessible by two means, including a very long beach hike north from Clearwater Beach or by boat. 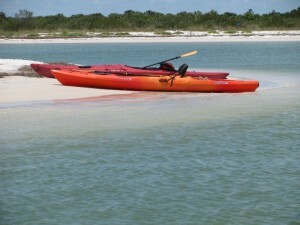 The most popular means of arrival is the Caladesi Island ferry which cruises between Honeymoon Island beach and Caladesi. A fun way to arrive is by kayak. The most often used launch site is the Dunedin Causeway which serves as the bridge to Honeymoon Island. 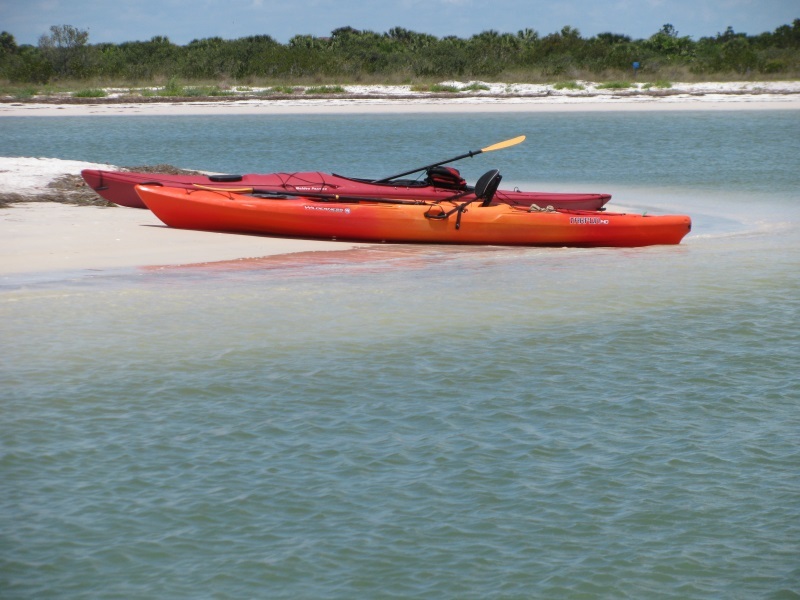 A great kayak rental shop sits on the shores, right at the best launch site on the narrow strip of land. Be sure to ask directions and be prepared to do some paddling, this is not necessarily a kayak trip for beginners. The good news is that some of the very best sightseeing in the region is along the route. The directions to the Caladesi Island kayak trail are simple -pretty much. 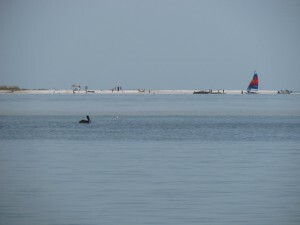 Launch westward from the Dunedin Causeway toward the northern tip of Caladesi Island, which is close by and clearly visible. 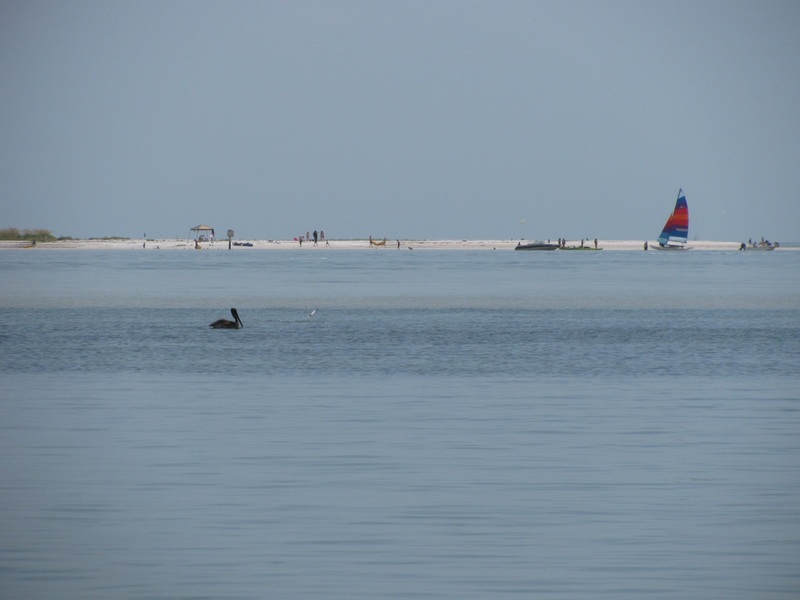 When you arrive at the other side of the waterway, be sure to get out and play or stroll on the north end of the island. It is one of the most beautiful strips of white-sand beach you will find on Earth. Be mindful of the bird sanctuaries! Once you are back in the boats, head south along the inland coast of the island. This is the long part of the trip. You will row past mangroves for quite a while. Enjoy the ride while you admire the mangroves and spot birds among the branches and stilt-like roots. Watch for the passing ferries. You will be able to locate the route to the Caladesi Island docks by seeing where they enter the mangroves. The opening is wide and has channel markers for larger boat traffic leading up to it. Cruise down the channel, turning right then left. Signs ought to tell you if you make a wrong turn by warning of shallow water. At long last you will arrive at the boat docks. But where is the kayak trail? 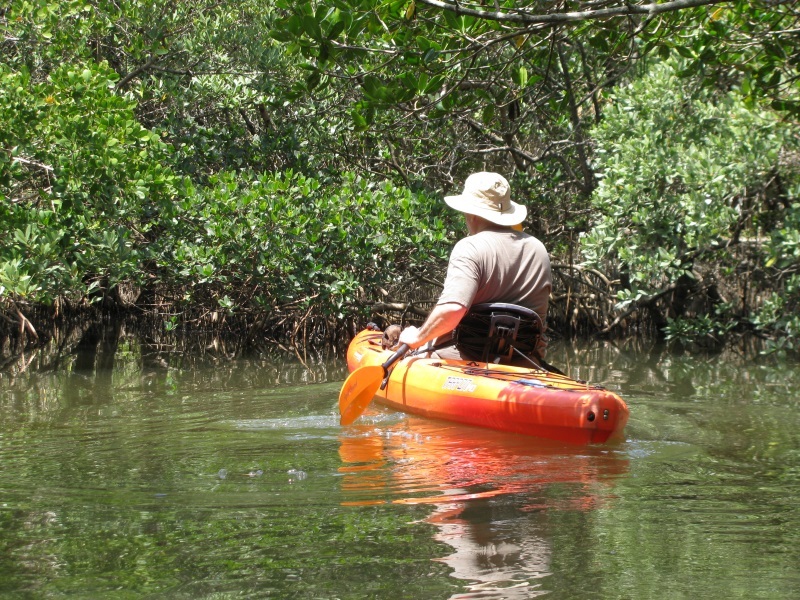 Hidden along the edges of the Caladesi Island docks is the beginning of the kayak trail. Although it is nearly invisible to the eye, it is actually easy to find! Keep to the far left while entering the docks, keeping the mangroves at your elbow. When you round the left hand turn inside the dock area, you will see a maintenance area dead ahead. Keep looking to your left and you will see an opening in the mangroves with a small white sign. It is marker number one for the trail. Peering inside you will see a tunnel created by the roots and branches of the mangrove forest. It’s ok. Go ahead on in. 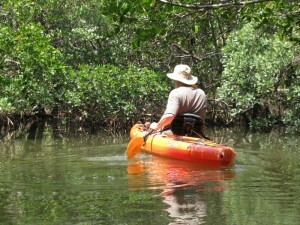 Enjoy the trail through the mangroves. You should see wildlife along the way. Birds hide out among the branches, and keep an eye out for the crabs that run up and down the mangrove roots. The entire trail is shaded, making for a very pleasant paddle. This is one of the top kayak adventures in the area, so enjoy. When you come back out into the Sound, just turn left and before long you will pass by the entrance of the channel leading to the Caladesi Island docks. Once you identify this landmark, you are on your way back to the Dunedin Causeway by the same way you arrived. Trip time: 2-4 hours. 2 Comments on "Caladesi Island Kayak Trail"
Yes, head South down the inland coast of Caladesi Island to find the entrance to the kayak trail. Thank you! Fixed the entry above.